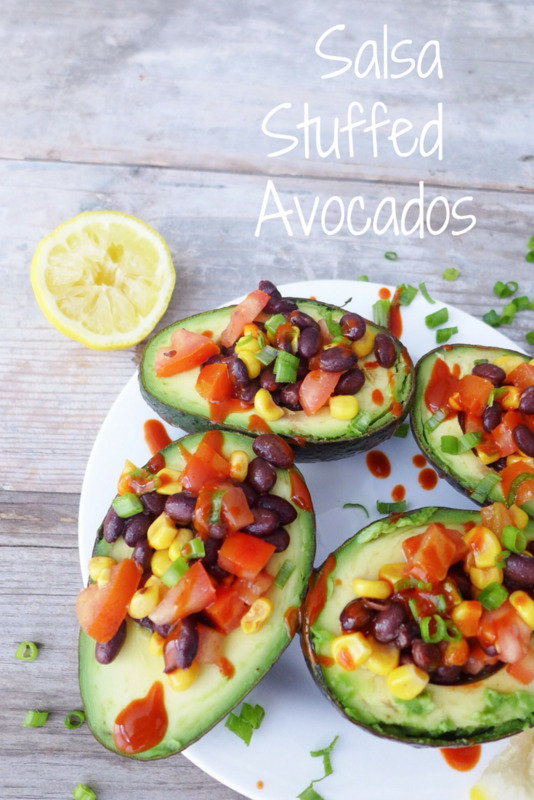 This super awesome avocado recipe involves loading up some perfectly ripened avocados with a chunky, tangy salsa and topping it all off with a killer hot sauce and your favorite tortilla chips. Now I can get down with some salsa, y'all. Chunky salsa, smooth salsa, extra spicy salsa… really just some pureed tomatoes will do. Yeah, I'M INTO SALSA. I'm pretty sure you could spoon some salsa over any dish and it would go. Maybe not like cheesecake or pickles - but everything else. The salsa that we will be using to stuff the avocados with is a tomato, corn, and black bean base. The combo is chunky and hearty and full of marvelous flavor. Stir in some seasoning and oil and you're setting yourself up for major flavor success. What I love about these Salsa Stuffed Avocados is that they are oh so perfect for serving as appetizers at get-togethers or even as a course at dinner parties. Or if you're anything like me, you'll most likely enjoy them for second breakfast while still wearing your favorite 10-year-old, hand-me-down pajama pants. 1. In a small bowl, combine tomato, corn, black beans, olive oil, onion powder, paprika, lemon juice, and salt & pepper. Stir well to combine. 2. Arrange avocados on a plate for serving. Spoon the mixture over each half of avocado. Garnish with green onion, hot sauce, and lemon slices. Serve with tortilla chips if desired.